This is a beautiful looking yacht that draws many compliments and comes with bags of history, right back to her original drawings that come with her! She looks very well maintained and the owner has high standards and seems to have looked after her very well. As a close neighbour, I regularly see him cleaning and tending to her - her deck and coach roof paintwork look lovely and her varnish work seems in generally very nice condition. Her accommodation is compact, as you'd expect, but there's plenty of room for two and to get out of the weather, if needed and she comes with everything needed for a weekend away, or perhaps longer. The only addition you might like to think about could be a water system, though this may detract from her original feeling. 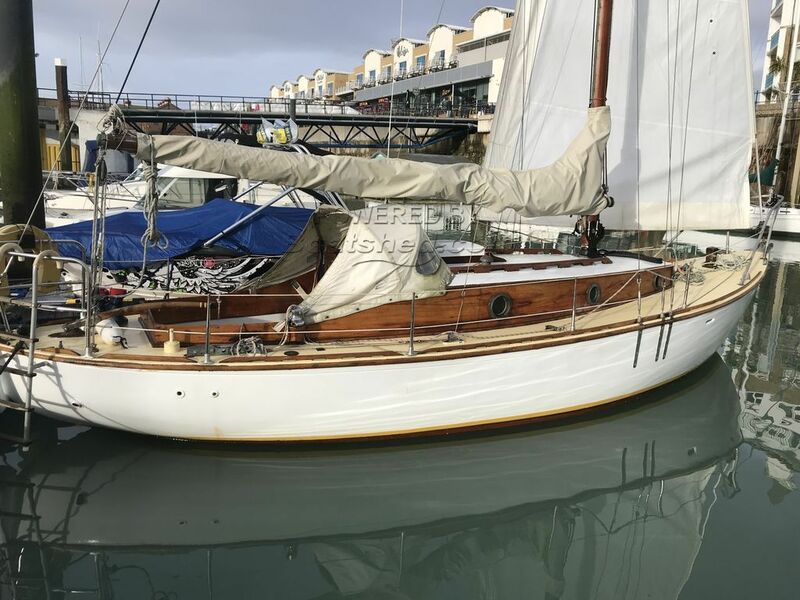 If you'd like your own piece of history that the owner says she sails very nicely and doesn't leak at all through her deck or coach roof, then we really recommend a look at her. This boat was featured in Yacht Monthly in 1939 and the magazine including the feature is included in her sale. This 5 Tonne Auxiliary Cruiser has been personally photographed and viewed by Tim Kingston of Boatshed Brighton. Click here for contact details.